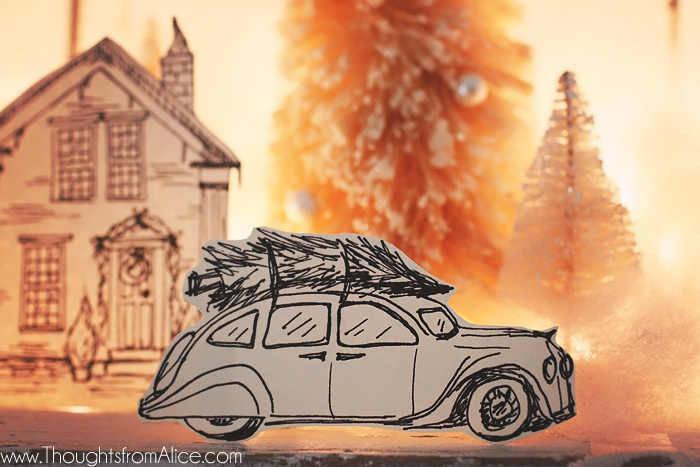 Today, I am thrilled to be participating with several other talented bloggers to bring you tons of early Christmas inspiration and free printables! 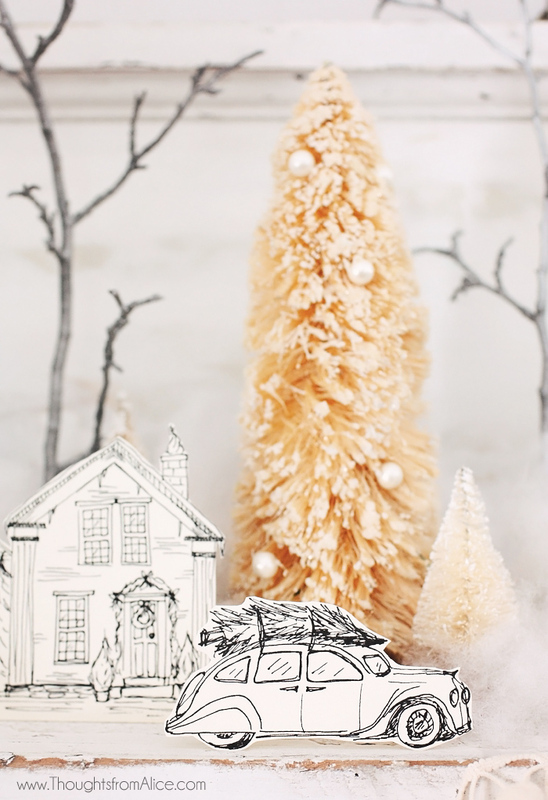 I created a diy holiday village for our mantel and for you! 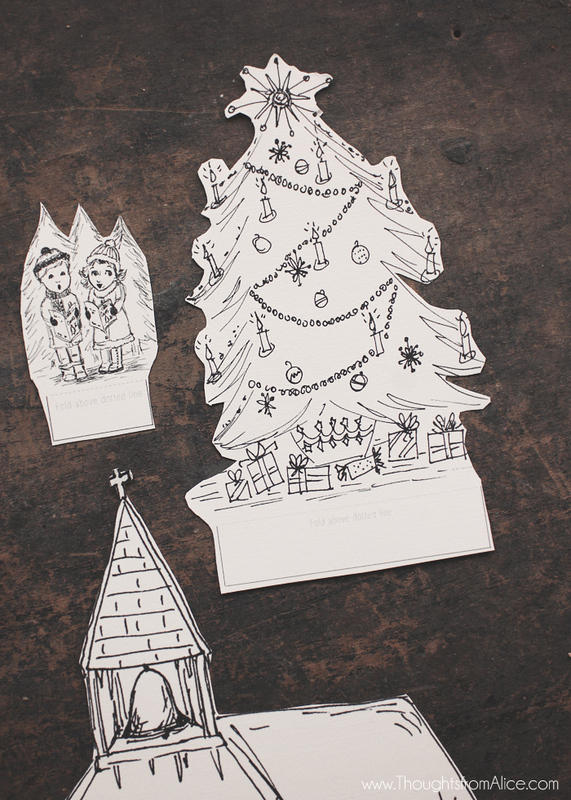 Simply print it off, cut it out, and voila…instant Christmas town for you to display with your festive decor. It is no longer available (not that I would have been able to afford it anyways, let’s be real here), so I decided to take my own spin on it for the holiday season. 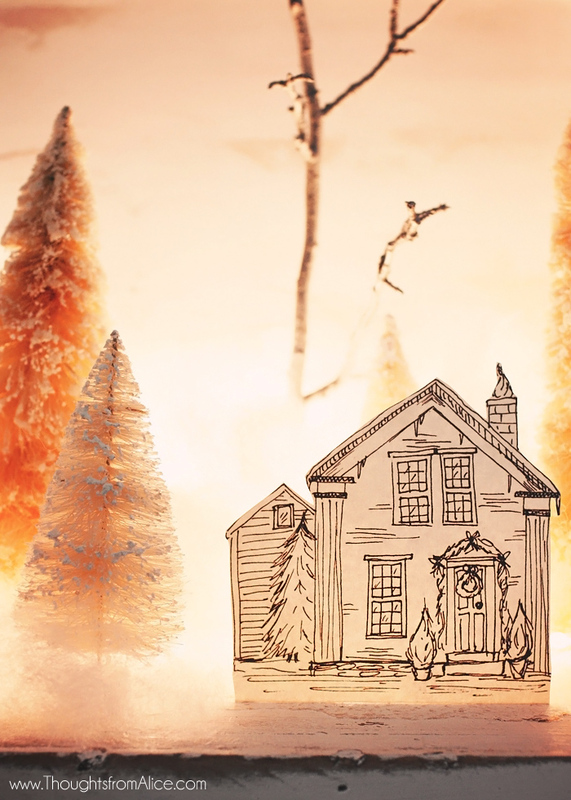 To create my own version, I used some drawing paper, a black Sharpie marker and inspiration from old books, Christmas cards and photographs of cute houses. I have always loved drawing and used to do portraits with pencil all the time. It was “my thing” way back in the day but very time consuming. Then for years, I hardly ever drew, basically forgetting my gift. Having kids has brought back a love for it, since I am always drawing their favorite characters or whatever their imaginations can dream up. 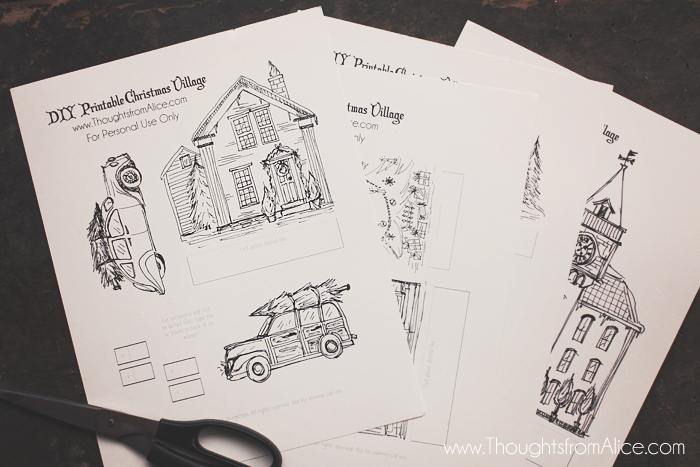 I love using fine point markers for quick, quirky illustrations like this project these days. I have no time for the detailed drawings that I used to do in high school and college! Included in this nine piece village set you will find a church, town buildings (which we are calling a hotel and a restaurant around here), a city hall building, a cozy house, two little carolers (inspired by my kids), a snowman and lamppost, a decorated town tree and two vintage cars taking their Christmas trees home of course! My two year old Owen loves to drive the cars to the “restront.” And Hazel likes to see herself and Owen singing their carols. To create this, I scanned all of my original drawings onto the computer and then printed them on my favorite ivory colored, linen card stock (I didn’t want them to be stark white). 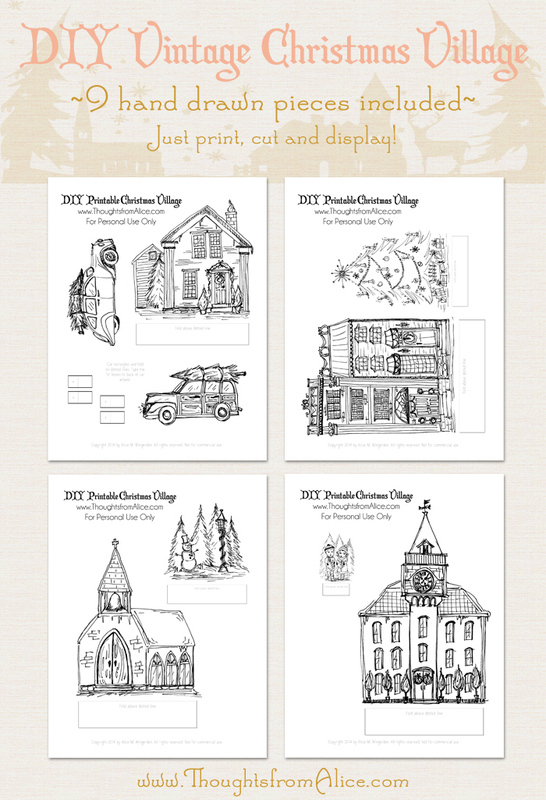 To use this set yourself, I have included four printable .pdf sheets for you below. 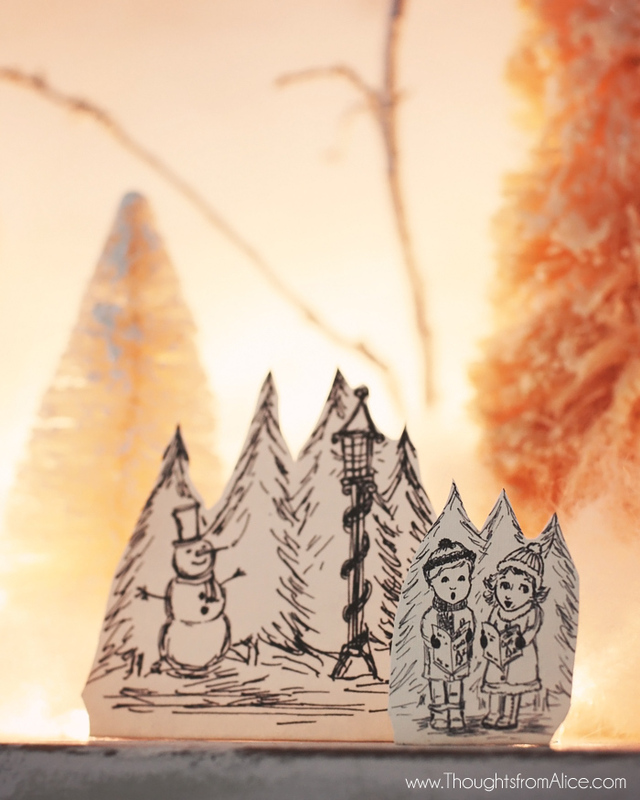 All you have to do is print them on card stock or other heavy weight paper and cut them out. For cutting out the shapes, I simply stayed pretty close to the drawings, only leaving a tiny edge. Some are a little trickier than others, like the Christmas tree, which is why I included some photos for you to see how I managed to cut around them. I didn’t do anything fancy to make them stand, other than fold the bottoms. The cars are a little different: I cut out small rectangles to tape (or glue) behind the wheels to keep them up. 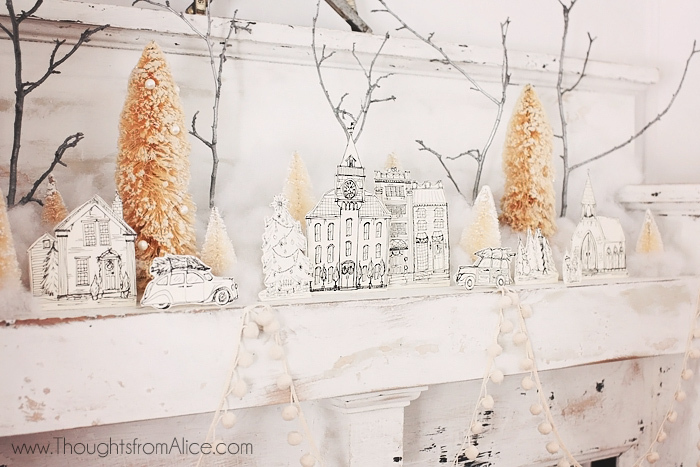 I knew that I wanted these to go on our old mantel (again inspired by the Anthro version) but first, I wanted to create a wintry scene, which was fairly easy if you want to recreate it. I started by gathering some branches from outside and spray painting them metallic silver. 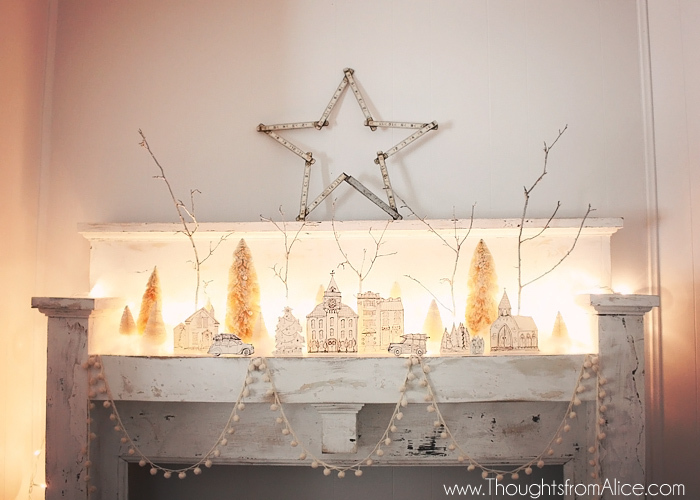 While they were drying, I lined the back of the mantel with a strand of white Christmas lights. I layered it back and forth a few times to fit and add lots of light behind. I tied it with string in a few spots to keep it together. Once the painted branches were dry, I took some old thread spools to use as bases by putting the branches in the holes. Then I lined them up along the very back. I used fiber fill (stuffing for pillows, etc.) as snow and spread it all over the lights. After that, I took some bottle brush trees and started filling them in all around keeping the largest in the back. Next, it was time for the little village. You can have fun with this part rearranging it until you get it just how you like. 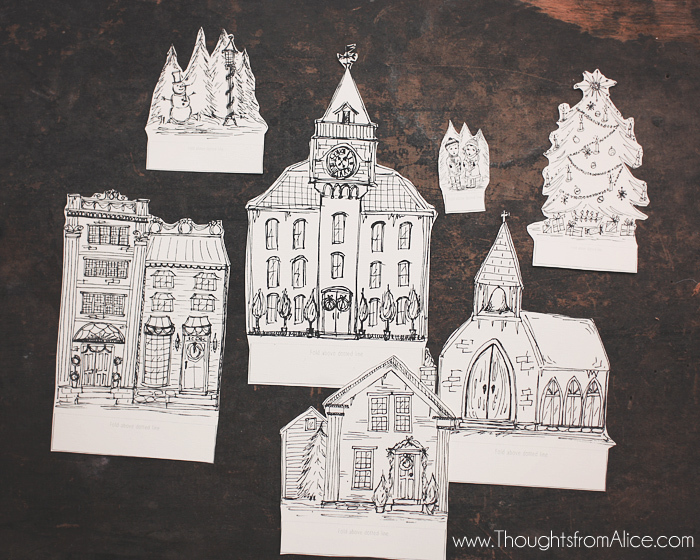 I chose to put the house on one end, the church on the other and the town buildings in the middle. Then the cars went “on the road” and the carolers went by the snowman and lamppost. It really was super easy and made me feel like a kid again. I have always had a thing for miniatures and projects like this. It definitely brought out all those warm fuzzy feelings and reminded me of the artist inside that sometimes I forget about. 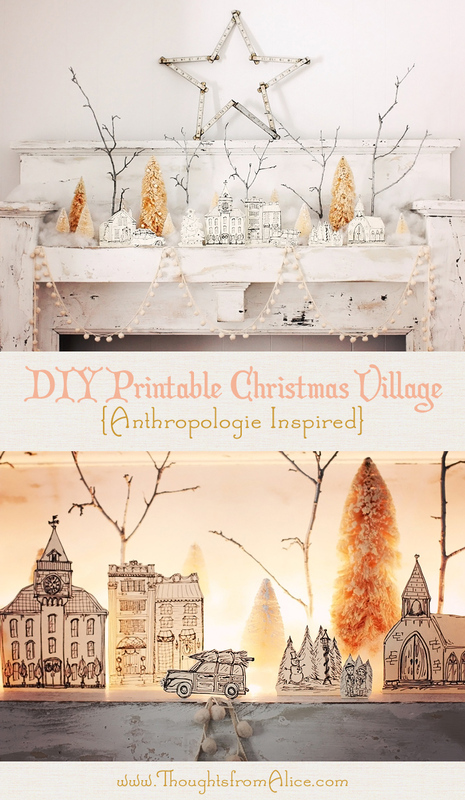 I hope that you enjoy this Christmas village if you decide to print it off! 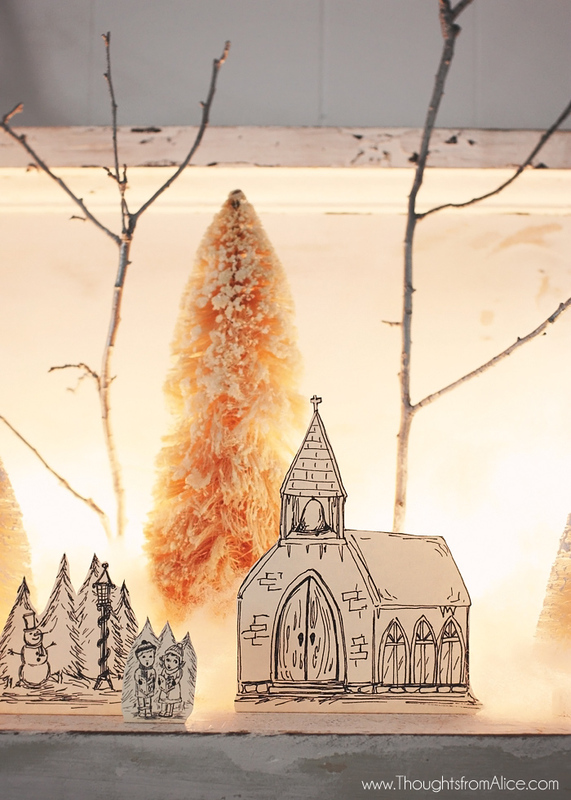 You can let your imagine go wild with it…color it in with colored pencils or let your kids; put the designs under glass cloches or in mason jars with faux snow in the bottom; attach them to cardboard and turn it into a 3-dimensional village. So many different options if you get creative! 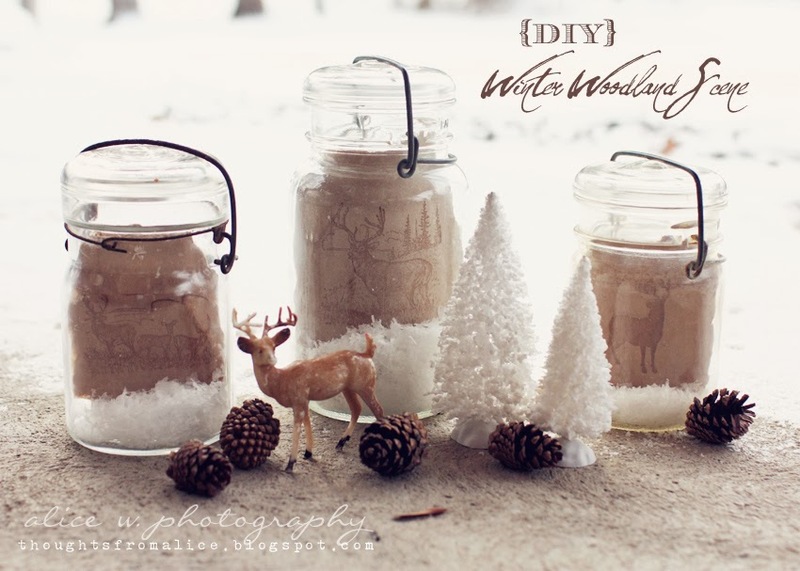 If you do use it in your holiday decor, I would love to see it! Send me a pic or let me know if you have shared it on your own blog or elsewhere. I hope it brings out some childhood wonder in you as it did in me. Click on the link below to download the printable .pdf sheets. There are four in total, so don’t forget to grab them all! I also made a folder with the .jpeg files of each piece individually, in case you want to make them larger or use for other projects like greeting cards, your own personal printables, etc. Have fun with them! You can download the .jpeg files here. Please note: These are offered for personal use only. No commercial use or reselling in any format. Thank you! 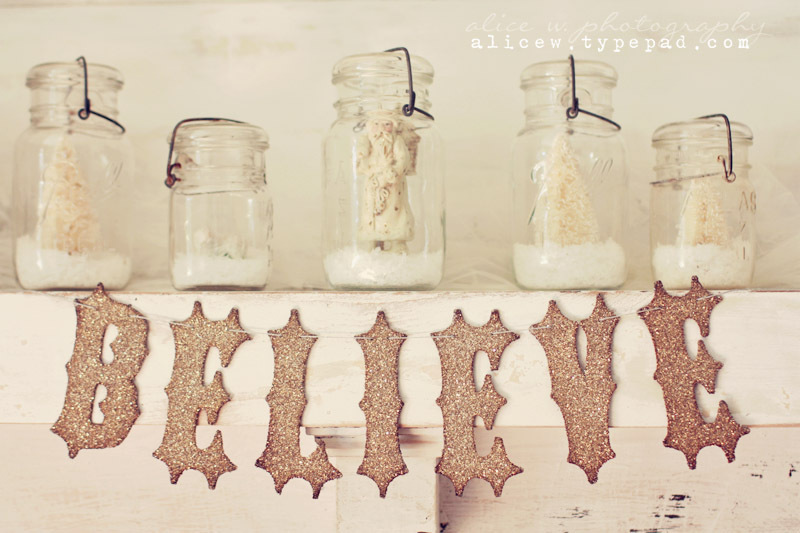 Now, head over to visit all of these other inspiring vignettes and get more free printables! Thank you so much for taking the time to draw these and to share with all of us! 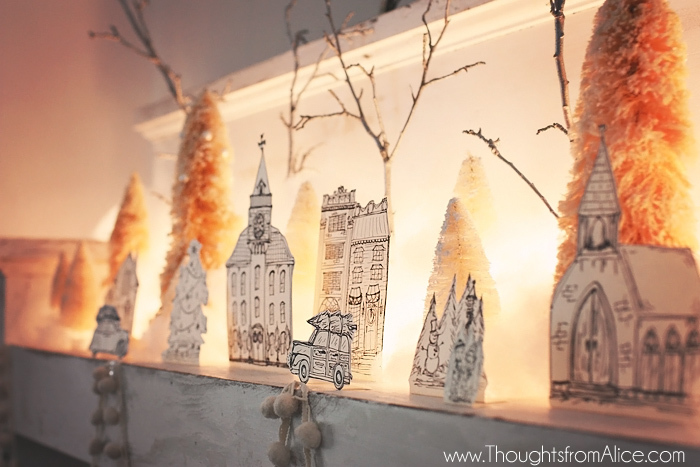 They are simply beautiful and I love your mantel Christmas display! One of the best projects I have seen in a long time! These will be on my bookcase shelves for sure! I LOVE it! 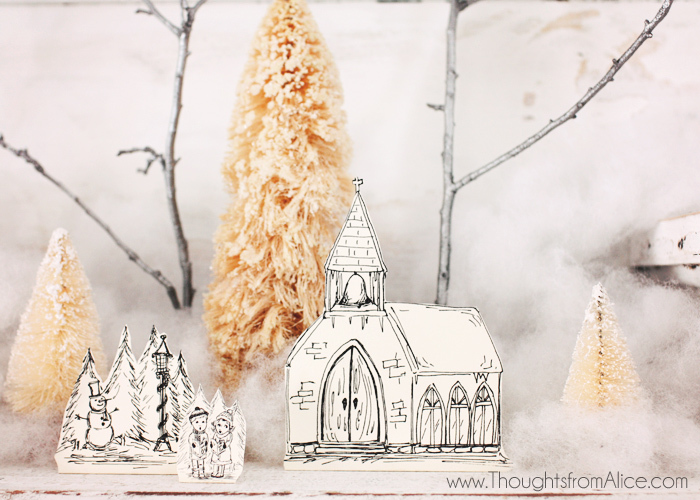 Thank you for sharing these beautiful printables! What a great project-and yours looks spectacular! This is beautiful Alice!!! God sure blessed you with amazing talent!! I will be printing them off for sure. Thank you!! Well done!!! They are very cute and I love that you don't need to get fussy with cutting or mounting them. It will be fun to watch the drawing Alice return! Alice, you have completely knocked it out of the park!! 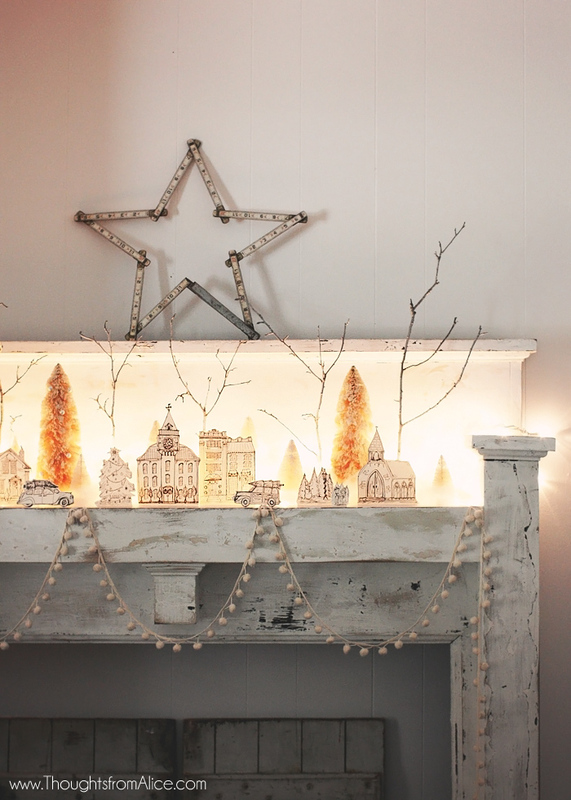 This is the most beautiful mantel I've ever seen. I love that you created it with your own drawings. The lights are a perfect touch. Truly amazing … I'm blown away!! OMGoodness! Love this village. It definitely captures the childhood wonder of Christmas. Thank you for sharing your talent with us! So cute ~ SO talented. Thank you so much for sharing with us! I am printing it out to use on the mantel in my bedroom. Then I'm going to display it and then I am going to take pictures of it and Instagram it, LOL! Thank you soo much for sharing your awesome talent with us!! I am honestly sitting in my house, dying right now. DYING. This is STUNNING, Alice!!!! Thank you for sharing these. They are gorgeous! LOVE, LOVE, LOVE these! Thanks for sharing! You, my friend, are the genius! This is so unbelievably cool I can't even stand it!!!!!!! OMG! Oh my gosh this is amazing and absolutely beautiful! I've also been eyeing that white pom pom garland from Anthropologie and planned on making my own version, and I LOVE how yours turned out! I absolutely loved seeing these today! I really miss seeing your talent through sketching, you have always amazed me with your skill! I decided I am going to print these in duplicate, so I have front and back side, then I'm going to tie ribbon loops for hanging on my hutch knobs in the kitchen and probably use them as ornaments for my tree, as well! Great job, thanks for sharing, my beautiful and talented daughter! …sniff….. what a sweet Mom! oh I just love your village so much! 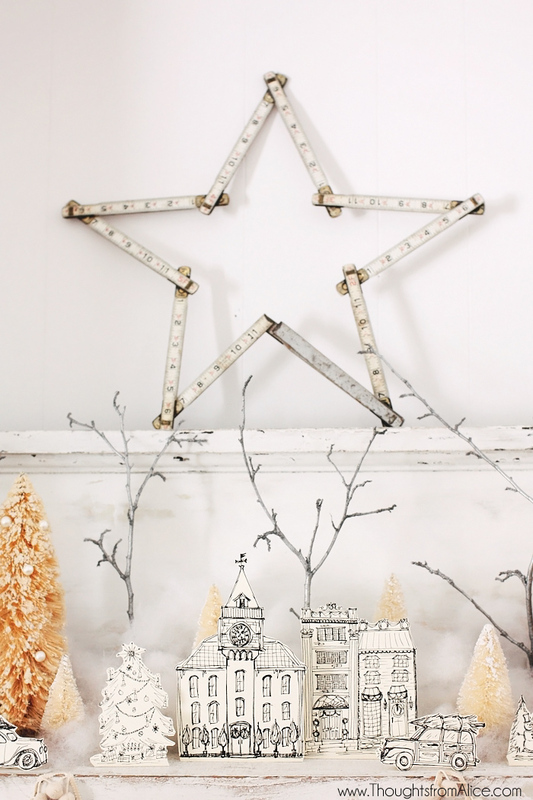 it looks so beautiful on your mantel. 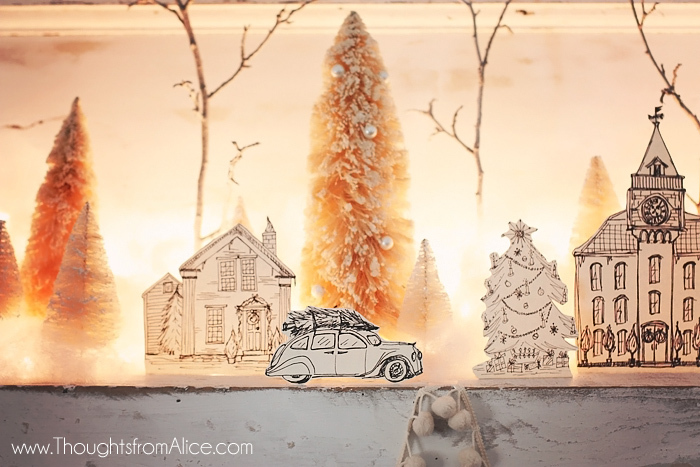 So pretty Alice, and a great idea too. Your mantels are always amazing! Alice, these are so amazing!!!! I'm having my hubby print them at work for me because I know Conor will love them – who knows this little village may mingle a little with lego 😉 Beautiful! 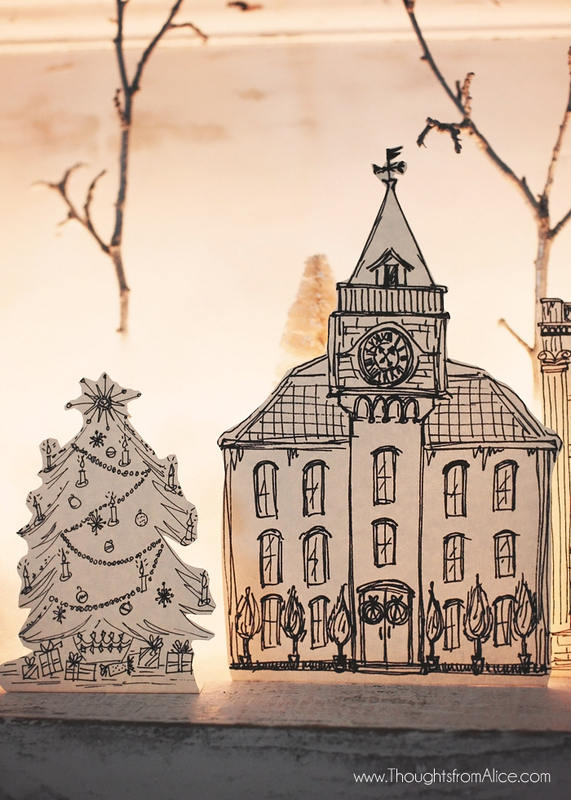 Your little village is adorable. 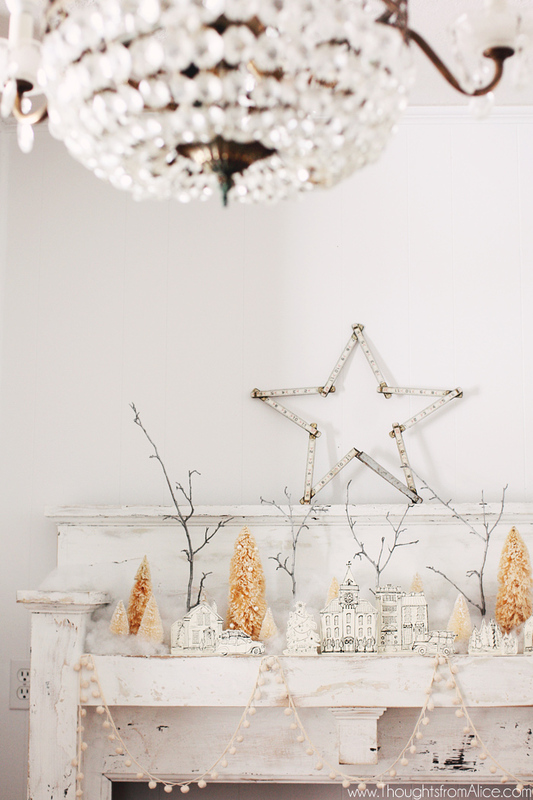 I love how you styled it too with monochromatic trees and mantel. Thanks for sharing it. Thank you for sharing your beautiful drawings, you are very talented and I love your style! What a lovely gift you have shared with us. Bless you and your family! May you make beautiful memories this Holiday Season! This is GORGEOUS! Totally blown away by how cool this is! Well I just love this to pieces! Thank you!! Alice, I love this so much! Thank you for sharing!! This is absolutely beautiful, adorable and fun, Alice. I just LOVE it. Thank you so much for sharing! 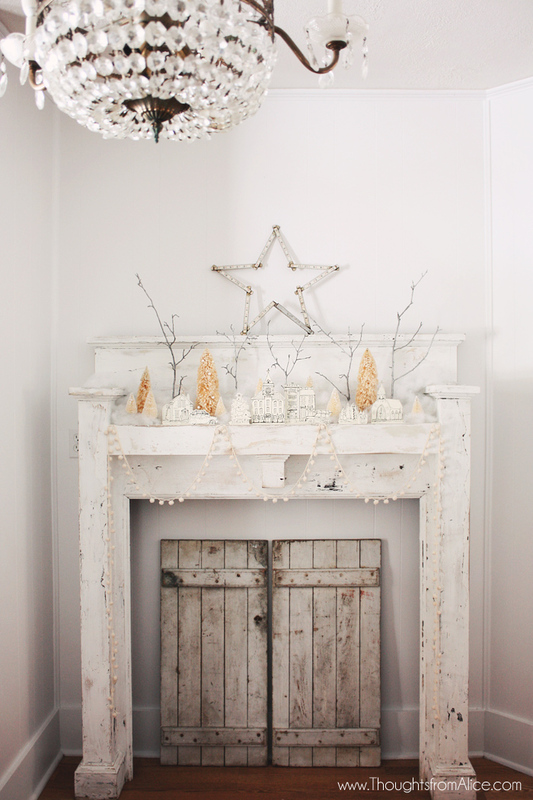 Your mantel looks gorgeous! This is so beautiful and charming, Alice! Thanks so much for sharing this gift with us. Your village is stunning. Thank you for sharing your artistic talent in such a generous way. Tears sprang to my eyes when I read your mom's comments. What a wonderful, supportive, loving mother! I'm in love! These are so awesomely adorable, and I'm realllllly wishing I had a printer. I am definitely gonna have to remember this post for when I do. Thanks for sharing your talents with all of us! 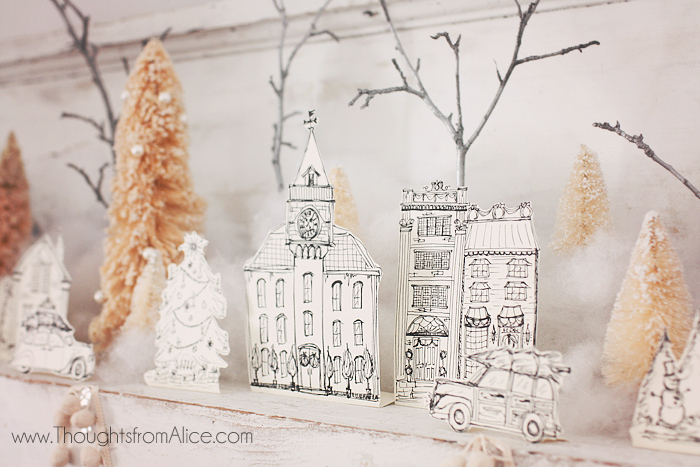 Alice… these are absolutely AMAZING! You have quite a talent. I have downloaded and can't wait to use these this Christmas! Thank you SO much. 🙂 Love, Love, Love! This is so adorable! I love that you put your kids in it. I am definitely printing this out. Thanks for sharing this with your readers! Alice! 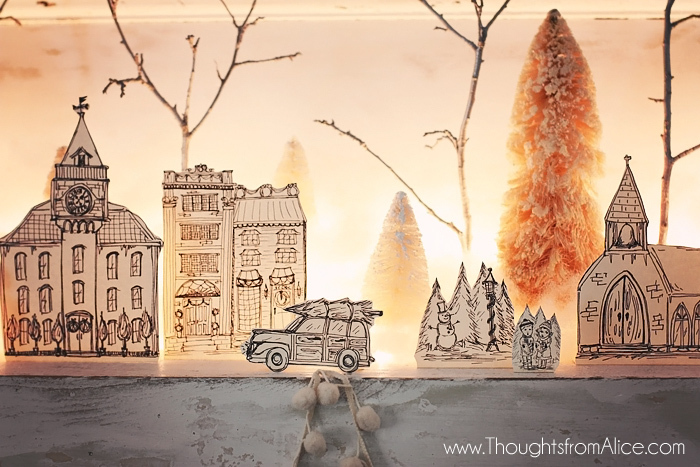 This village scene is incredibly lovely! What a fabulous idea! It sort of reminds me of a set of small plastic colorful houses I had as a kid. Love this! It would look so pretty lined up in the transom window of our 100+ year old farmhouse! Oh! I love this little village! Thank you so much for sharing with us, I'm printing to use in my decor… and I hope you don't mind but I'll probably copy your mantle down to the pom-pom garland, I am so in love with it! I have only just now come across this and think it's terrific!!! Can't thank you enough for making it available to us. Love it – A LOT!! Thanks again and Happy Christmas to you! This is absolutely charming! Thank you so much and Merry Christmas to you and your family! These are lovely – thank you so much for this wonderful gift! Ittle village is fabulous! MERRY CHRISTMAS! Too late for Christmas, but just in time for a wintery scene right after Christmas… Thanks so much for sharing this beautiful village with us! It will replace my nativity scene and no empty space will be left… Thank you very much for this beautiful work of art, dear Alice! Thank you so much for taking the time to draw these and to share with all of us! LOVE YOUR SITE! Semplicemente meravigliosi, grazie per questa preziosa condivisione, allieteranno il mio Natale a casa e in ufficio, hai un dono speciale. absolutely love this. Going to use it to decorate some frosted office cubicle glass 🙂 🙂 thanks for sharing!!!! they are AMAZING. thank you for sharing! I see I'm 3 years late discovering this adorable village, but who cares – it's as cute now as it was then. Pinned it because I love it!!! Absolutely darling. How generous of you to share your beautiful creations!